Buyers’ expectations in the ideal home have evolved, so sellers need to price accordingly. Carefully Pricing: Sellers must price according to their location, condition, upgrades, updates, décor, and overall appeal. With higher prices and a dramatic rise in interest rates this year, housing has slowed considerably. Interest rates have risen from 3.9% in November 2017 to nearly 5% today. Combine that with annual appreciation around 5% and monthly mortgage payments have increased by 19%. As a result, demand is down 23% compared to last year and the active listing inventory is 48% higher. 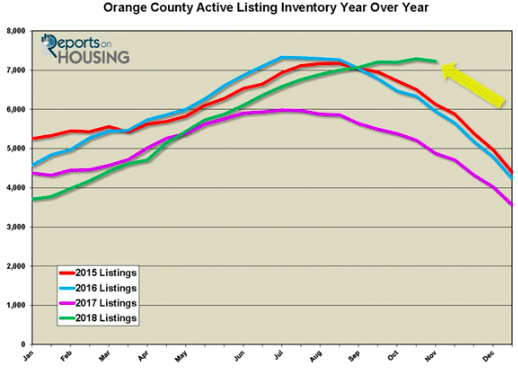 Due to the sharp increase in supply and a striking drop in demand, the Expected Market Time for Orange County has increased to levels not seen since 2011. The Expected Market Time has grown from 54 days in April to 117 days today, a Balanced Market (between 90 to 120 days). It is knocking on the door of a Buyer’s Market (over 120-days) for the first time since January 2011. The 117-day height was last reached in July 2011, over seven years ago. Last year at this time, it was at 61 days, a Seller’s Market (less than 90-days). Sellers no longer get away with stretching the asking price. In fact, they must be extremely careful in pricing or they will not find success. It is not as easy as pricing it right at the most recent comparable sale either. Rarely are two homes completely identical. There is a lot more that goes into the value of a home: location, condition, upgrades, updates, décor, and overall appeal. Buyers today are much different than buyers of past markets. Buyers used to overlook some deferred maintenance and lack of upgrades and updates. They focused on the “bones” of a home, the floor plan, and location. They were not afraid of a home that required a little bit of “elbow grease.” Today, buyers want a home that is turnkey, ready to go. They want it to look like a model home. What happened? Quite simply, it was Chip and Joanna Gaines. HGTV’s hit show, Fixer Upper, about home design and renovation, starred Chip and Joanna Gaines and aired for five years, from 2013 to its final season this year. This show, along with the overabundance of real estate related reality shows, changed buyers’ expectations and approach to real estate. Buyers now know the approximate cost, time, and hassle in improvements, updates, and remodels that go into a home. These real estate show carefully displayed the purchase price, the cost to upgrade, and the time it took to complete the project. The result was always a spectacular home that left the viewer wanting to move in. This is where the expectations and desire for the perfect, turnkey home originated from. Today’s buyer wants a home to look like a model. When it falls short, buyers subtract from value. If a home needs carpet, the walls are scuffed and dirty, the kitchen is outdated, the yard needs work, the patio is cracked, the light fixtures are old, the bathrooms are dated, and there is plenty of deferred maintenance, buyers will subtract heavily from value. Many buyers will just skip these homes altogether and wait for a home to come along that is already done and ready for immediate occupancy. To find success, sellers must price their homes carefully considering the comparable sales and factoring in a home’s condition and overall appeal. The closer a home looks to a model, the faster it will sell. Pricing a home at the last comparable sale, yet it needs a lot of work, will simply not sell in today’s market. As a result, sellers have a choice. They can either invest in their home and update it prior to placing it on the market; or, they can adjust the price to reflect the work that needs to be done. Buyers will also subtract for the hassle to do it themselves. With the market knocking on the door of a buyer’s market, price is everything. Active Inventory: The active listing inventory dropped by 1% in the past two-weeks. The active listing inventory continues to bounce around the 7,200 mark. Originally, it looked as if the inventory had reached a peak at the end of September when it reached 7,207, and then two weeks later dropped to 7,201. It was the first time in 2018 that the inventory went down. Then, on October 18, it climbed to 7,292, adding 91 homes. Today, two weeks later, it dropped to 7,231, shedding 61 homes, or 1%. So, it appears as if the peak has been reached and the inventory will fall for the remainder of the year. Typically, the active listing inventory peaks in July or August, but this year there was a two-month delay. The inventory is normally dropping like a rock during this time of the year. The active listing inventory drops for the remainder of the year after peaking, but a peak this late in the year will not allow enough time to drop much. The net result will be a lot more homes on the market to start 2019 compared to recent years. Last year at this time, there were 4,878 homes on the market, 2,373 fewer. That means that there are 48% more homes available today. The year over year difference continues to grow every week. The trend of more homes on the market year over year is here to stay. Demand: Demand dropped 6% in the past two-weeks. In the past two-weeks, demand, the number of pending sales over the prior month, decreased by 117 pending sales, a 6% drop, unusually high for this time of the year. Typically, demand remains flat until Thanksgiving and then dramatically plunges for the remainder of the year, the Holiday Market. Demand now totals 1,857, the lowest demand reading for the start to November since 2007. The current market slowdown is because of muted demand. Last year at this time, demand was at 2,409 pending sales, 30% more than today, or 552 additional pending sales. The expected market time, the amount of time it would take for a home that comes onto the market today to be placed into escrow down the road, increased from 111 to 117 days in the past two-weeks, a Balanced Market (between 90 and 120 days). Last year, the expected market time was at 61 days, substantially different than today. Luxury End: The luxury housing market improved slightly. In the past two-weeks, demand for homes above $1.25 million increased by 2 pending sales, a 0.8% increase, and now totals 260. It remains at levels last seen at the end of January. The luxury home inventory decreased by 16 homes and now totals 2,147, a 1% drop. The overall expected market time for homes priced above $1.25 million decreased from 252 to 248 days over the past two-weeks. Year over year, luxury demand is down by 65 pending sales, or 20%, and the active luxury listing inventory is up by an additional 435 homes, or 25%. The expected market time last year was at 158 days, significantly better than today. For homes priced between $1.25 million and $1.5 million, the expected market time increased from 152 to 175 days. For homes priced between $1.5 million and $2 million, the expected market time increased from 207 to 212 days. For homes priced between $2 million and $4 million, the expected market time decreased from 368 to 305 days. For homes priced above $4 million, the expected market time decreased from 463 to 403 days. At 403 days, a seller would be looking at placing their home into escrow around the middle of December 2019. The active listing inventory decreased by 61 homes in the past two weeks and now totals 7,231. The inventory most likely reached a peak for 2018 two-weeks ago. Normally it peaks between July and August. Last year, there were 4878 homes on the market, 2,353 fewer than today. So far this year, 13% fewer homes have come on the market below $500,000 compared to last year, and there have been 26% fewer closed sales. Fewer and fewer homes and condominiums are now priced below $500,000. This price range is slowly vanishing. Demand, the number of pending sales over the prior month, decreased in the past two-weeks by 117 pending sales, and now totals 1,857. Demand peaked in mid-May at 2,726 pending sales. Last year, there were 2,409 pending sales, 30% more than today. For homes priced below $750,000, the market is a Balanced Market (between 90 and 120 days) with an expected market time of 90 days. This range represents 43% of the active inventory and 56% of demand. For homes priced between $750,000 and $1 million, the expected market time is 102 days, a Balanced Market. This range represents 19% of the active inventory and 22% of demand. For homes priced between $1 million to $1.25 million, the expected market time is 119 days, also a Balanced Market. For luxury homes priced between $1.25 million and $1.5 million, the expected market time increased from 152 to 175 days. For homes priced between $1.5 million and $2 million, the expected market time increased from 207 to 212 days. For luxury homes priced between $2 million and $4 million, the expected market time decreased from 368 to 305 days. For luxury homes priced above $4 million, the expected market time decreased from 463 to 403 days. 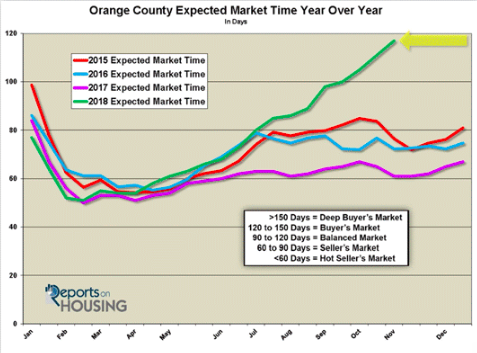 The expected market time for all homes in Orange County increased from 111 to 117 days, a Balanced Market (between 90 to 120 days). It was at 61 days last year. Distressed homes, both short sales and foreclosures combined, made up only 0.9% of all listings and 1.8% of demand. There are only 20 foreclosures and 46 short sales available to purchase today in all of Orange County, 66 total distressed homes on the active market, down by four from two-weeks ago. Last year there were 58 total distressed homes on the market, nearly identical to today. There were 2,090 closed residential resales in September, 24% fewer than September 2017’s 2,746. September marked a 25% drop over August 2018. The sales to list price ratio was 96.9% for all of Orange County. Foreclosures accounted for just 0.4% of all closed sales, and short sales accounted for 0.3%. That means that 99.3% of all sales were good ol’ fashioned sellers with equity.